This past Monday we had a workshop out on the farm where Dr. John Skinner of the Entomology department at UT talked about honey bees and beekeeping in Tennessee. He began with explaining just how important honey bees are to organic crops, and said insect pollination is responsible for one out of every three bites of food consumed! Quoting his hand-out, “The estimated value of pollination to Tennessee crop agriculture exceeds 130 million dollars a year.” Unfortunately, there have lately been major set-backs to the honey bee population, like mites and hive beetles, so Dr. Skinner has been working to make beekeeping easier for the average farmer and manage mite populations. One of the things I never knew was the fact the color and taste of the honey that bees make differs according to the plants they visit for nectar. Some types of honey are a dark amber tint and have a richer taste than other types with a light golden color and a sweeter taste. 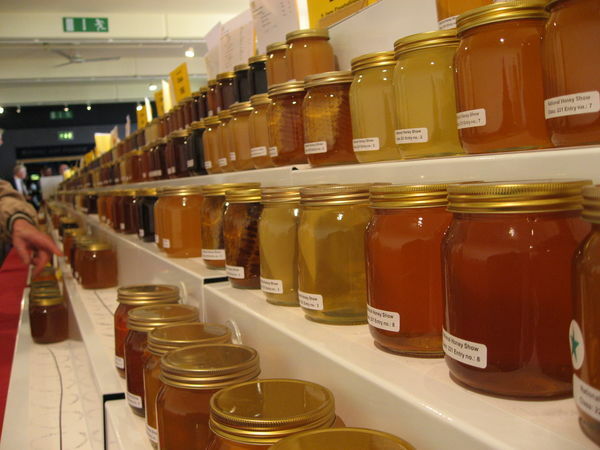 If you know your honey’s, you can easily become a connoisseur of the yummy stuff! Honey also has health benefits (in moderation, of course) that include everything from energy and immune system boosts to remedies for sore throats and hangovers. Check out this website for other honey facts. 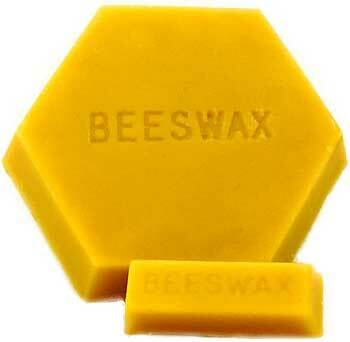 Products other than honey include beeswax (which has a lot of common uses), candy, candles, and plenty of others. 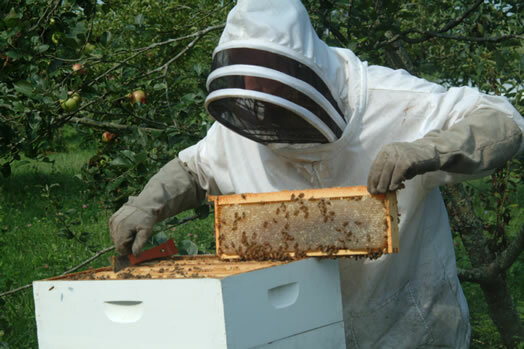 Organic farming offers benefits to pollinators like the honey bee, but some practices can actually harm your honey bee population. By avoiding some of these practices (like primary tillage, flame weeding, plastic mulch and classical biological control), you can help support the local bee population. Of course, a couple of the practices above are unavoidable, but Dr. Skinner simply suggests minimizing them. The workshop got me so interested in beekeeping, and I hope I can someday have my own beekeeping operation! Hey, all! I hope our loyal readers are doing very well this fine, warm and beautiful spring day. Few things make me want to have a nice healthy green meal on the front porch like a beautiful day. So here is a great recipe from the New York Times for what is basically a green hummus. I spiced mine up with some cayenne pepper, white pepper and sea salt but it is very adaptable so don’t just follow the recipe, make it your own! 1. Steam the broccoli for five minutes until tender but still bright. Refresh with cold water and drain on paper towels. 2. Turn on a food processor fitted with the steel blade, and drop in the garlic. When the garlic is minced and adhering to the sides of the bowl, stop the machine and scrape down the bowl. Add the broccoli, chickpeas and cumin, and process to a coarse purée. Turn off the machine, and scrape down the sides of the bowl. Turn on the machine again, and pour in the lemon juice and olive oil with the machine running. Process until smooth. Add the tahini and salt to taste, and blend well. Serve with bread, croutons or pita, or as a dip with vegetables. *Best eaten the day of due to the lemon changing the flavor but mine is still tasty after two days. Two weeks ago, Lee Ellis, the Research Associate with ETREC, gave us an evening training session on equipment safety and operation. The choice piece of equipment was a small Kubota tractor and on the 3-point hitch a tiller. After an overview of safety precautions we had went over in a previous training, Lee went over the tractors controls, explaining all the bells-and-whistles. The tractor is also equipped with a front end loader that we weren’t able to experience, but I’m pretty sure everyone was fine with that. We, the interns, grad students, and some faculty, took turns going in a row down the side of the plot behind our storage building. Mary went first and did very well breaking the ice and setting the tone for all of us to hop on the Kubota and do some tilling. Everyone did well and no one was hurt so I guess we passed. It was very informative, and whether we had tractor experience or it was our first time on one, a very beneficial session. The fresh tilled soiled made us all get an itch to plant and the warm season is coming. Thanks Lee for the insight and training. While on vacation last week in Seattle, I was given the opportunity to tour the University of Washington-Seattle’s urban farm. Tucked away behind their greenhouses and near the Biology building, is what amounts to an urban oasis. The group is providing students, faculty, and the community opportunities to get their hands dirty in the city. They also provide a weekly seminar series related to sustainable agriculture. Their main set up is small raised beds, and it was clear that they didn’t have as cold of a winter as we did since many of their vegetables had been growing all the way through winter without high tunnel (or plastic low tunnel if needed here and there). In TN, we have the availability of land and land size is what mainly determines how much we can grow. In Seattle and other cities, this is not necessarily the case. 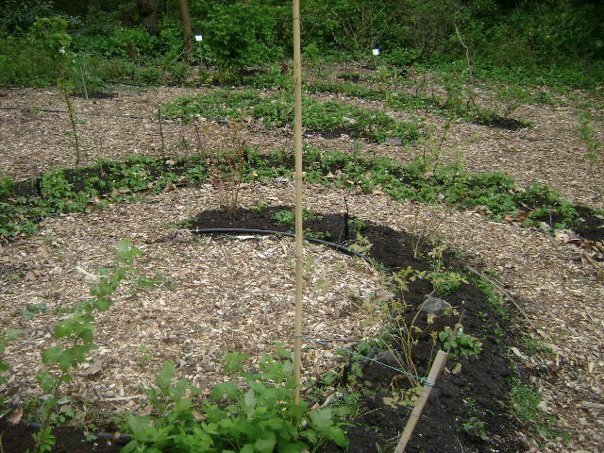 While our farm functions to show growers in th e South with land how to grow large (and small) productions, UW’s farm acts in a way to teach the city dweller how he or she can grow his or her own food in a small space. This is why they utilize raise beds and other small scale methods. One method I really liked was their use of large plastic tree planters that the grower could have a couple in the yard and grow in that manner without having to break ground/use a tiller (I’d say a tiller is few and far between in Seattle…just my thinking). This method could also be used for say Lasagna Gardening and the grower could rotate from cool-warm-cool quite easily. My friend and I drove through many of the neighborhoods and it was fascinating to see that along with landscaping being done, many houses had raised beds built out front and some already started with cool season. It is nice to see an urban community, that while maybe they didn’t grow up on a farm or have farm experience , wanting to grow their own food and almost show case what they are growing. 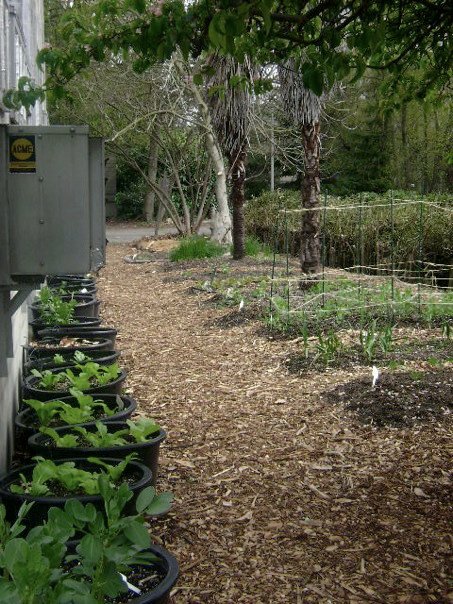 All in all, UW and Seattle are doing some fascinating work with urban agriculture.